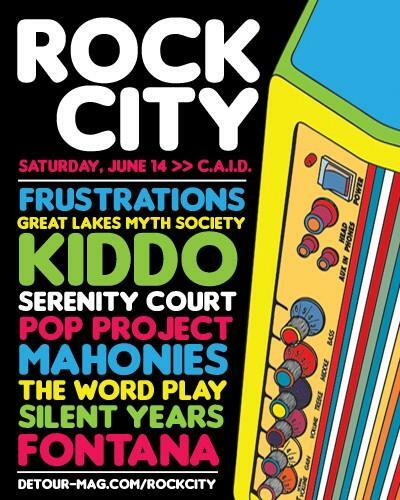 Join Handmade Detroit and Loop for projects galore June 14th @ the CAID as part of Detour‘s first Rock City Fest. Stop by our table to rock ourself out and join our instant art gallery! Make your own rock wardrobe! We’ll provide the clothes and tools ready to be made into your new summer rock look — everything from legwarmers to shredded T-shirts. Everyone is an artist! Guests and musicians will be encouraged to make artwork on the spot, which will be instantly mounted on the CAID’s main floor gallery space. Both events are free to attendees. We’ll be there all day! Art supplies and clothing will be on hand, but feel free to bring your unwanted supplies to share as well. Check out the Rock City site for more info on the schedule, tix and times.